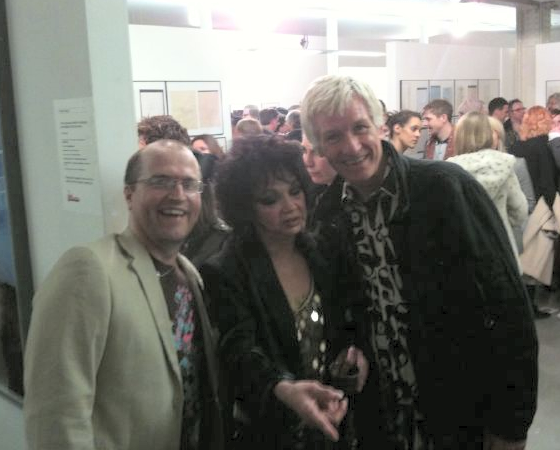 This page contains all the articles that match the Duggie Fields-tag, chronologically sorted, from old to new. The above message reached the Reverend a couple of weeks ago. 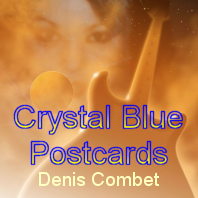 It was written by JenS, a Cambridge friend of Roger Keith Barrett. She is the one who introduced Iggy to the Pink Floyd founder exactly 40 years ago. What follows is her rendition, as told exclusively to The Church of Iggy the Inuit, and now published for the first time. Her rememberings are only slightly edited here and there and re-arranged a bit per subject. Some explanatory notes have been added. I first met Ig in the summer of 1966. 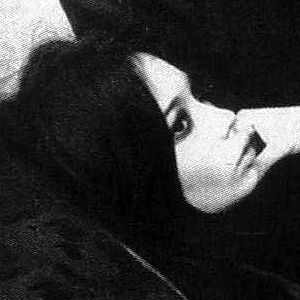 I saw her again in spring 1967 at Biba. She admired a dress I was wearing and invited me to a party that night. From then on we used to go clubbing. She was a lovely, sweet, funny girl and was always on the scene at gigs and events. Biba, where Iggy first met JenS, was without doubt the single most important boutique of London. The shop features in the IN Gear documentary that also has Iggy. The first really important customer to favour Biba was Cathy McGowan, the Ready Steady Go! 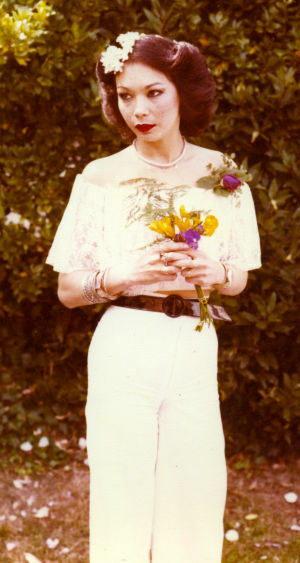 presenter who (…) quickly made a new Biba dress a staple of her weekly wardrobe for the show. This meant that every Saturday morning ‘teenage girls from all over the London area would race over to Abingdon Road and the piles of new, inexpensive clothes that awaited them’. Ig was not known as Iggy the Eskimo. She was simply Ig or Iggy and probably picked up the nickname along the way at school or something. I think she was a Londoner. 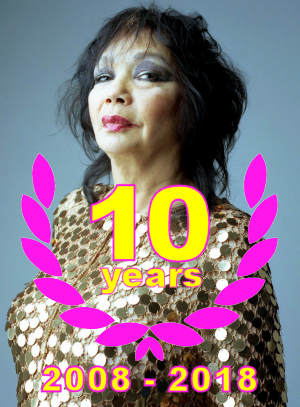 She was quite a lot older than us and had been around a while on the London Club scene. She invited me once to a party with Dusty Springfield and crew. Later she started hanging out at Granny’s (Granny Takes A Trip, FA) and turning up at UFO. Update 2011: It was revealed in March 2011 that Iggy is born in December 1947, making her a bit younger than Syd Barrett. See The Mighty Queen. One important player in Dusty Springfield’s crew was Vicki Heather Wickman, who managed Dusty and co-wrote You don’t have to say you love me that became a number one hit in 1966. Vicky had been a booker-writer-editor-producer of the weekly Ready Steady Go! shows for many years. Dusty Springfield herself had been a (part-time) presenter of the RSG!-show and that is probably where she met her future manager (Update: not quite true - they knew each other from 1962 and even shared a flat together, see also From Dusty till Dawn). Wickham and her team ‘scoured the trendiest clubs looking for good dancers and stylish dressers to showcase’. The Church has a hunch feeling that Iggy may have been – during a certain period at least – a regular at the RSG! Show, especially as she was spotted, in November 1966, at an RSG!-party by New Musical Express (cfr. article: Bend It!). It will be a ginormous work but the Church is planning to scrutinise several Ready Steady Go! tapes from that period to see if Iggy can be found in the public or amongst the dancers. I have no idea about who her parents were. She was a war baby and may have been Chinese. There was a large Chinese community in London at the time. Of course Ig the Eskimo is an easy assumption to make. Anyway, I don't think I can help any further as I never discussed it with her. I took Ig to Wetherby Mansions in January or February 1969 where she met Syd Barrett. He was 22 and she must have been about 24, 25 years old. The point is she was never Syd's girlfriend as in a ‘relationship’ with him. She was only at Wetherby Mansons very briefly, a matter of two or three weeks max. I've not seen her since but often wondered where she is. Syd painted the floor of his flat in blue and orange before The Madcap Laughs photo shoot, but did he do that especially for the photo shoot? I was staying with Syd between the New Year and March '69. I hadn’t seen much of him since the summer of 1968 'til then. Anyway, at that time, the floor was already painted blue and orange and I remember thinking how good it looked on the Madcap album cover later on when the album was released. I didn’t see Syd again though until 1971, so it stands to reason the floor was already done when I left. 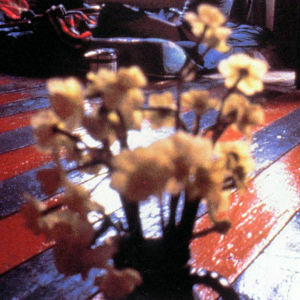 Mick Rock wrote: "Soon after Syd moved in he painted alternating floor boards orange and turquoise." This doesn’t imply that it was especially done for the photo session. In an interview for the BBC Omnibus documentary Crazy Diamond (November 2001) painter Duggie Fields said that Syd painted the floor soon after he occupied the flat, not that it was done on purpose for the photo shoot. The floor (of Syd’s flat) was not painted prior to, or especially for, the Madcap photo shoot, which took place in March or April of 1969 and not October as has been suggested. I left for the States in March 1969 and Iggy stayed on at the flat with Syd and Duggie (Fields) and there seemed to be other dropouts around from time to time. Ig happened to be there still when the shoot came about, which was great because we have such a good record of her. I introduced Iggy to Syd shortly before I left, and she was around when I left. She wasn’t there for long and generally moved around a lot to different friends. It’s very doubtful she was still there in October or November 1969. She just happened to be there for Mick’s photo shoot, which is great because she was lovely girl. One day in October or November I had cause to drop in at Syd's flat on my way home to leave him a tape of the album, and what I saw gave me quite a start. In anticipation of the photographic session for the sleeve, Syd had painted the bare floorboards of his room orange and purple. I remember reading this once before and being puzzled. It would seem he’s talking about 1969. But which tape was he leaving? The 1968 sessions or the recuts (from 1969, FA)? It would seem he’s talking about the recut. It’s a bit confusing especially to me as the floor was painted, definitely before Christmas 1968. The Madcap Laughs photo session had to be in the spring of 1969, probably it occurred the first week in March. Storm and Mick say they can only come up with the dates of August, or even October, November. This may have been when they came together to look at the shots for the cover, in other words when it was known the album would definitely be released and decisions on the cover had to be made. Part 2 of JenS's chronicle will further delve into the legendary Madcap Laughs photo sessions, pinpointing the date somewhere in April 1969. Levy, Shawn: Ready Steady Go!, Broadway Books, New York, 2003, p. 112, p.194-195. Our thanks go to Barrett alumni Stumbling... (aka Beate S.) and Lost In The Woods (aka Julian Palacios) from the Syd Barrett Research Society who made this encounter possible... and to JenS for her invaluable testimony about what really happened in those early days of 1969. Direct link: When Syd met Iggy (Pt. 1). Posted on 2009-01-24 at 14:40. The Reverend’s last post was rather freewheeling and not always up to par. For one mystical reason or another Iggy’s divine intervention didn’t come through, possibly hindered a bit by an abundance of pints of that black stuff that tastes so good by the gallon. So it is time to clear things up, like the surge in that same glass, although what remains isn’t crystal clear at all but rather a dark shade of ruby. As always, many thanks to JenS for spending her cybertime with the Reverend and passing him the stories that happened 40 years ago. It is obvious that any mistake and/or misinterpretation is entirely by the hand of the author of this blog and not by his witness. The last post may have hinted that Gretta and Rusty were from Cambridge, just like Syd and (many of) his friends. JenS specifies that they weren’t. You may be inferring that Rusty and Greta were from Cambridge but they were from Suffolk and went to Colchester Art School (50 miles from Cambridge and London respectively), and had only recently come to London. They were not on the underground scene as such and later that summer they left London and went to live in Devon where they then married and settled. The importance is not how Greta (or Gretta) is spelled but that is pronounced as with a double T.
Rusty and Greta, one T or two TT’s, it doesn’t really matter. Her name was Margaretta. And the allegations that they were speed freaks, is once again denied. Rusty and Gretta were not drug-addicted. Greta may have done a lot of speed, but she was not drug-addicted and as mentioned at the beginning. They were goofing. I think Duggie must have got these two sister muddled and at this time. Trina was long gone. She went to America in January (1969) but didn’t know Duggie particularly. …Gayla was not there. She moved in later hooking up with Syd in May or June. She was the one who dropped Syd off when he flew out to meet Emo (Iain Moore) in Ibiza. They had known each other for a few years, as she was an old school friend of Lindsay’s and used to visit them when they were staying in Egerton Court. When Gayla was around (after Iggy had left) Syd’s behaviour or mental health deteriorated (let it be clear that the former does not imply that these women actually triggered the situation) as has been stated in several biographies, perhaps due to an excessive Mandrax intake. Some events that happened then would fuel the many Crazy Syd legends that were floating around during the Seventies and Eighties. This is a little misleading and it is unlikely that this was the first time Syd had met Iggy. She was well known on the scene and it’s more than likely he’d have come across her before. She was around all the same venues as the rest of us, UFO, the Speakeasy, the Roundhouse, Alexandra Palace. Whether he ever chatted to her or was formally introduced in any way is unknown to me, but what I did was to take her round to Syd’s new flat. And at the time she had nowhere to live, so she stayed on. Malcolm Jones once wrote how he witnessed that Syd Barrett could write a song in a few minutes of time, referring to Here I Go, probably the wittiest song ever by Syd. The Church wondered if this track, recorded on the 17th of April 1969, was perhaps written with Iggy in mind. This was an inside joke, albeit not a very good one. Here I Go was a song that Syd Barrett had already home-recorded, on acoustic guitar, in 1967, although it was then titled Boon Tune. When The Purple Gang were looking for a successor of their Granny Takes A Trip-single Barrett, whose band Pink Floyd had shared the same studio to record Arnold Layne, handed over the demo tape to Joe Boyd. When the gang looked for the tape it was untraceable and Joe Boyd believed that Syd Barrett had retrieved the demo for use on the first Pink Floyd record. To make a long (and incredibly complicated) story short the Purple Gang Boon Tune single project was abandoned. Rumours went that The Deviants stole the original tape out of the studio and at The City Wakes festival someone said that it has been miraculously found back. 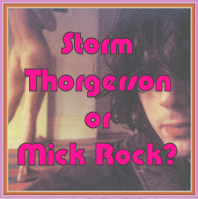 It would be nice if it could be issued on a new Syd Barrett record project (that was also rumoured at The City Wakes). Update 2014: The story of Here I Go & The Purple Gang can be found on the following page: Hurricane over London. Until then, brethren and sistren, and don't do anything that Iggy wouldn't have done! Direct link: Addenda and Errata with Gala and Gretta. Posted on 2009-02-22 at 15:02. Despite all that collective amnesia I think that Iggy can still be found. There are journalists, detectives... who have found more difficult "targets". However, an intense and widespread interest for her is a necessary condition. Your Church is a source of hope in this sense. 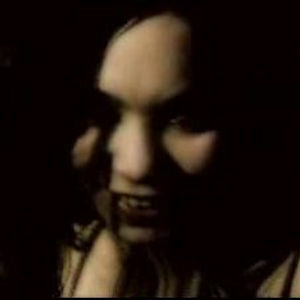 It lets many people know that once such a mysterious woman existed. It occurs to me that many people simply don’t want to know who or where Iggy is. Imagine finding a 70-year old woman and to find out that her words about that period are as simple and disappointing as "I don't like to remember that period. I was out of my mind..." That could be the end of a romantic dream. Besides the fact that Iggy herself is an extremely intriguing figure, there is also the possibility of obtaining a new narrative and facts surrounding Syd Barrett's life in that fabled year of 1969. Update: obviously this was written before Ig, or Emily, was traced back by Mojo magazine. 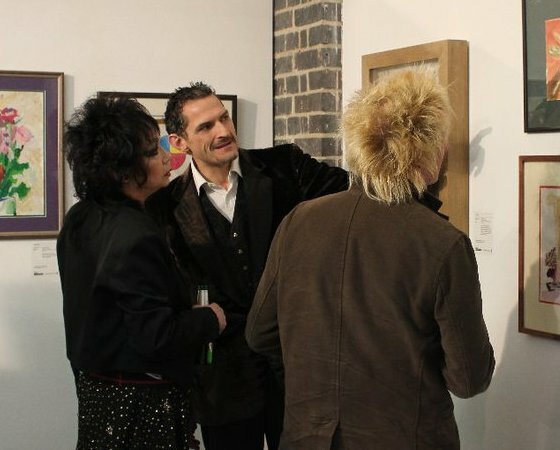 Mick Rock has apparently stated that he heard from Duggie Fields, the painter who was Syd Barrett’s roommate, that Iggy ‘went off with some rich guy in Chelsea and lived a very straight life’ afterwards. I have no idea who Iggy was or even what her real name was. She was never Syd’s girlfriend. They just got together from time to time. (…) I saw her not long after Syd left the flat and she was looking more like a Sloane Ranger. I heard she’d become involved with one of the voguish religious cults at the time. Nobody knew her real first name, never mind her surname, or if they did, they weren't telling. 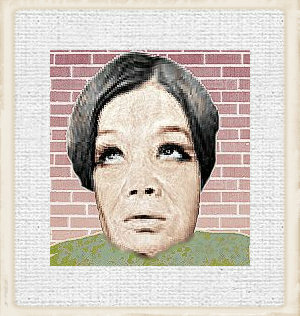 Duggie Fields recalls seeing her some time after the Madcap Laughs photo session and she was looking a lot more "sloaney". Most of the people I spoke to who knew her believe Iggy married a rich businessman and doesn't now want to be 'found'. The Cinderella story may be a case of confabulation. One witness supposes that Ig married rich and over the years this story infiltrates the memories of other people who, decades later, believe this is really how it all happened. This is not done on purpose; our memory likes to fill in the gaps and if we need to borrow memories of other people we will subconsciously do that. Pink Floyd history contains several anecdotes like that and in the several biographies and articles Floydian insiders have told about situations that were originally witnessed by others. Update 2016: After Syd, Iggy met a rich banker who was a witness of Jehovah, so the rumours were at least based upon some facts. The relationship didn't last though and Iggy didn't marry 'rich'. At The City Wakes festival in October and November of 1988 Anthony Stern’s Eskimo Girl movie was shown to the public and during the Q&A afterwards a member of the audience told the director that Iggy was living in Chelsea. Nobody knows who this person is but if (s)he attended the festival (s)he must have been a fan of Barrett or one of the members of the Cambridge or London Underground gang who took this opportunity to meet again after three decades. The Church would like to invite this person to come forward and to contact the Reverend. On the 7th of October 2006 the SydBarrett.net forum got the following message from a certain YoungForEternity. The forum in question is no longer active and the messenger only posted this single item. In 2006 Ig was (probably) 61 or 62 years old so theoretically she should no longer have been working, as the State Pension age for women born before 1950 is 60 (in the UK). But of course there are always exceptions. To qualify for a full basic State Pension she needed to have built up 39 years of National Insurance payments and perhaps that may not have been the case. The Church would also like the author of this post to come forward and to contact the Reverend. Update 2016: YoungForEternity was probably closer to the truth than we all expected. Iggy has indeed been working at a local supermarket. Blake, Mark: Pigs Might Fly, Aurum Press, London, 2007, p.141. Many thanks go to young 3D artist Arthur Fratzen who lend me a copy of his WIP Iggy 64. The Reverend's Unfinished Projects blog. Direct link: When I'm 64. Posted on 2009-08-01 at 17:00. (This is part two of our Mojo magazine review, for part one, click here). As if the world has suddenly been hit by a temporal rift in spacetime the March 2010 issue of Mojo music magazine has inundated the stores bearing a big (slightly photoshopped) portrait of a mister Syd Barrett. The well-written and rather accurate cover article, by Pat Gilbert, ranges from page 70 to 81 and tells the story of The Madcap Laughs, Syd Barrett’s first solo album. Two other articles are of particular interest to the Church as they describe the mythical presence of a ‘girl whose naked body graced the back cover of The Madcap Laughs’. 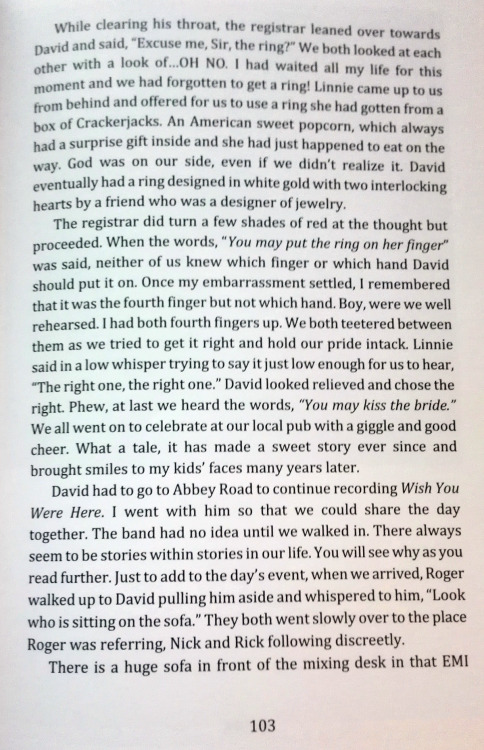 Last week we discussed the Who’s That Girl article written by Mark Blake, and this week the Church will scrutinize Paul Drummond’s In My Room (Mojo 196, p. 82 - 84). Out of courtesy (and for copyright reasons) the Reverend has decided not to publish the articles as long as the magazine is for sale in the shops. Update: Direct link to the article: Mojo March 2010. (hosted at the Church as the article was removed from the official Barrett website in 2016). 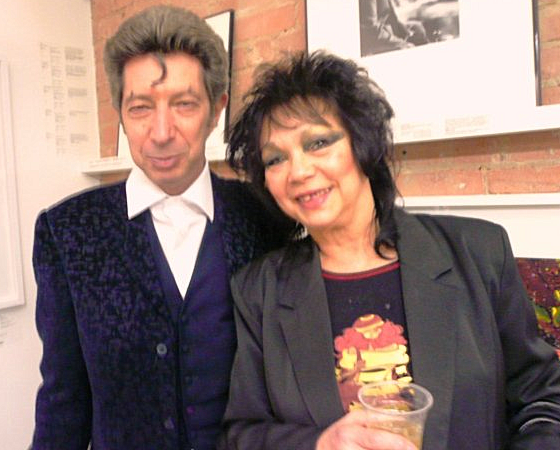 The article, about The Madcap Laughs photo sessions, has interviews with Duggie Fields, Mick Rock and - so it seems - Jenny Spires. But although she was interviewed by email for the main article by Pat Gilbert, she has told the Church she wasn’t really questioned about Iggy. I guessed, when I saw it, they must have looked at your site (re Daffodils and photo shoot etc…), as I was not asked about this or about Iggy. The Reverend could do no other thing than to summon the Holy Igquisition to stick in a few comments as the In The Room article clearly breathes the holy air of the Church but neglects to mention its existence in its columns. I was surprised they had mistakenly printed that I met her in 1969. This annoys me really because of its inaccuracy. JenS has situated the photo shoot in spring 1969 (March or April) (cfr. When Syd met Iggy 1). 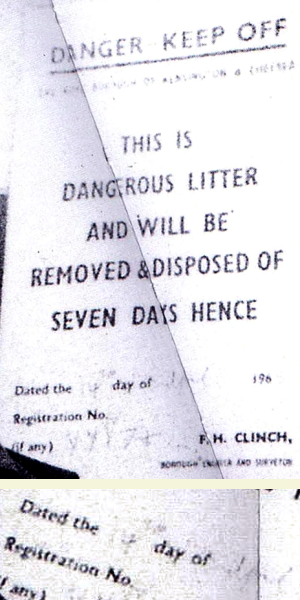 Further investigations by the Church have pinpointed a possible date in April 1969 (cfr. When Syd met Iggy 2). The Holy Church of Iggy the Inuit has discussed the lost In The Woods movie at great extent (cfr. Anoraks and Pontiacs). However the theory that the Lost in The Woods video was shot before the photo shoot is new and quite intriguing. However the idea that Iggy, Mick and Syd picked the daffodils is, according to JenS, quite silly. 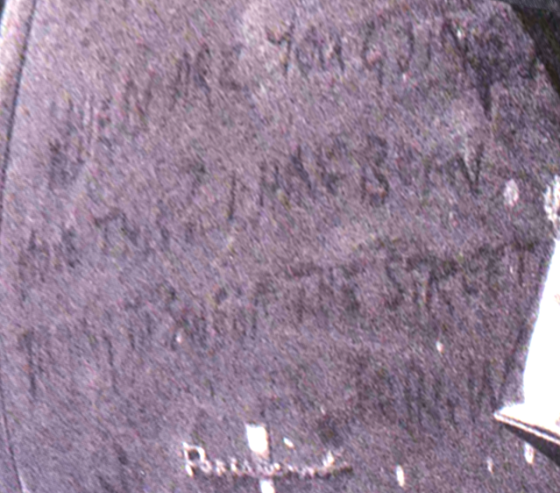 The story of Syd Barrett’s car has been the object of different posts at the Church (cfr. When Syd met Iggy 2), but the initial quest for the car was done at the Late Night forum by Dark Globe, Sean Beaver and others… they found out that the car appeared in the movie Entertaining Mr. Sloane. Unlike Mojo magazine, the Church does like to give credit to the people who deserve it. Mojo comment by Felix Atagong. It was nice to see that the many theories of the Holy Church of Iggy the Inuit have been reproduced in The Madcap Laughs photo shoot article, albeit without mentioning where these originally came from. However the Holy Igquisiton knows that any true believer will find the Church, so every Iggy publication will be beneficiary in the end. Ig’s story as published in the March issue of Mojo may be the butterfly effect that will cause the storm at the other side of the world. So perhaps, thanks to Mojo, the Church will be one day able to fulfil its quest. Lo and behold brethren and sistren, and don't do anything that Ig wouldn't have done. Direct link: Goofer Dust [(I've got my) Mojo (working)... Part 2]. Posted on 2010-02-05 at 18:50. 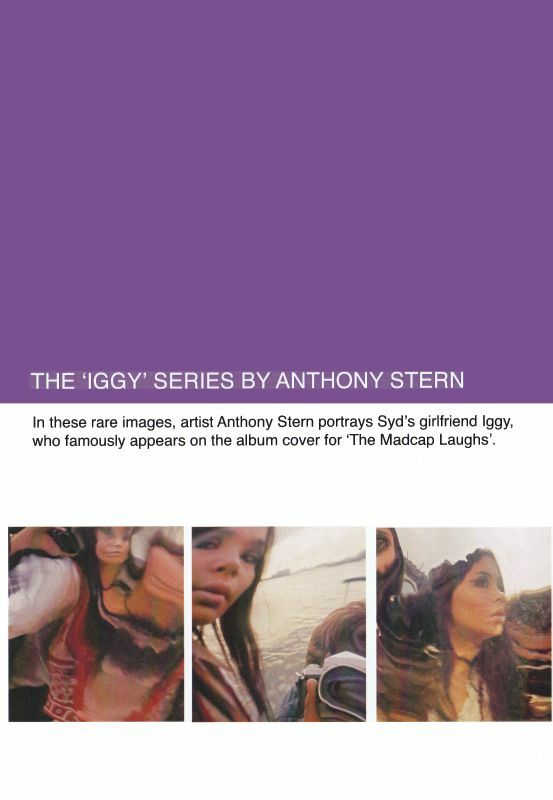 In the interview that Iggy - or should we say Evelyn - gave after nearly 40 years of silence in The Croydon Guardian she remembers how she helped Syd to paint the floorboards that would give an extra psychedelic feel to The Madcap Laughs cover picture. I remember that Iggy was involved with the floor painting project and that she had paint all over her during the floor painting time but I was not involved with the painting of the floor. Several biographies, including Julian Palacios’s Lost In The Woods (p.241), Tim Willis’s Madcap (p.106) and Mark Blake’s Pigs Might Fly (p. 141) describe Greta (sic) and her companion Rusty as homeless ‘speed freaks’. This description almost certainly comes from painter Duggie Fields who shared the flat with Syd and who wasn’t very amused with the many people Syd invited to say the least. He was so cool. Reserved and wary at first, then about halfway through he became super raconteur. (email to FA, 10 February 2010). Your blog relating to Syd Barrett mentions that Rusty and I were drug addicted. This is most certainly not true and an old friend of ours - Jenny Spires has made that fact known to you. My sister Catriona (Trina) and I met Jenny Spires during the mid 1960’s at a London grooming school. Jenny introduced my sister and I to Syd at 101 Cromwell Rd and at Edgerton Court. Rusty was not with us at that time. Rusty and I were not in the ‘steady stream of visitors’. In 1970 we were in Suffolk at the beginning of that year and Devon for the remainder of it. Not in London. We were not homeless either. Rusty and I left London for various reasons but primarily because I was expecting my first child. Syd was a very dear friend of ours and we did a considerable amount together in the 60's. Contrary to what I have read, we did not provide Syd with drugs. It was of course 40 years ago when Barrett recorded The Madcap Laughs and memories may have played tricks on people. 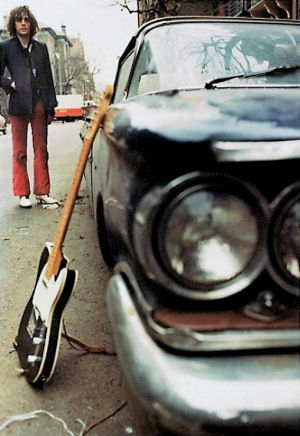 A famous example is the Mick Rock statement that Syd Barrett's car was bright pink while the pictures taken by him on that day show that the car was actually dark blue. On the DVD The Pink Floyd & Syd Barrett Story Duggie Fields remembers how Syd painted the floor boards of his flat. Without wishing to be vindictive where Duggie Fields and his interviews are concerned, surely, in order to obtain a balanced view of Syd’s chosen circle of friends, it would be sensible to back up assumptions with fact. Syd was a highly sensitive, almost delicate person, who was well aware of his constitution where drugs were concerned and perfectly capable of not being cajoled in to anything he did not want to do. To my knowledge, he did not take vast quantities of drugs. He enjoyed our company and invited us to stay at Wetherby Mansions where we shared good times together. Iggy was around at that time too and I remember her helping to paint the room in question. Dominique A., a French friend of ours, was also close to Syd at this time. Jenny, Catriona and I lived with her in Chelsea for a time. Update: the Church managed to contact Dominique A. but she refused to talk about the past. 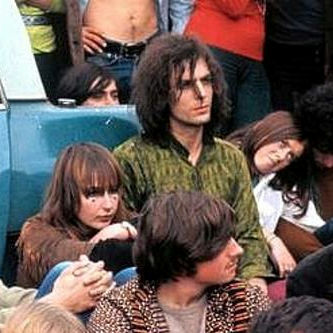 According to Margaretta the legends surrounding Syd Barrett contain many errors and “if they relate to my sister Catriona, Rusty and me, it is my duty to ensure that they are not perpetuated”. It is convenient to point a finger at others in order to explain Syd’s behavioural patterns. Syd behaved in his inimitable way long before he met us. Duggie did not socialise with us as a group – and his conclusion that I indulged in such a way - and on my own, is erroneous. From our point of view Syd was a vulnerable person, we cared for him and our aim was to encourage him to be creative, to write and play his guitar. After all, Rusty only wanted to write and play music with Syd - to give him drugs was not on our agenda; Syd - was ‘far out’ enough without them. Rusty and Syd played Syd’s songs and variations on them ’Oh baby my hairs on end about you’, ‘Octopus’ etc…, as well as songs they created together and basic blues. Syd Barrett with Gretta Barclay. In 1969 we went to Isle of Wight Festival together and at one point, in an effort to encourage Syd to play his guitar, we took him to stay with a musician friend of ours in Wales. Gala may remember the journey. Back to Rusty and Gretta. Hoping that the visit would inspire and encourage Syd to return to the musical ‘land of the living’ they took him to a ‘brilliant musician’ who lived in Solva, Haverfordwest, Dyfed: Meic Stevens. Life at home edged further toward the chaotic when Rusty and Greta, casual friends of Barrett’s, moved in. (…) Only recently arrived in London, not on the ‘underground scene’, they later left for Devon, where they married and settled. Greta may have done speed, but the pair were not the terrible people they have been painted as. When Rusty B. split with Greta, he came and stayed with Jack Monck and Jenny (Spires). In late 1972, Jack and Rusty started a new band, Rocks Off. Gretta Barclay remarried, is a proud mother and an even prouder grandmother, and according to her family ‘she is a wonderful amazing beautiful lady who has 3 children who love her very much’. The second part of the interview will be published in the weeks to come. The Church wishes to thank: Margaretta Barclay for her invaluable testimony about what really happened in those early days of 1969. Julian Palacios for additional information. Willis, Tim, Madcap, Short Books, London, 2002, p. 106. Direct link: Gretta Speaks. Posted on 2010-02-27 at 11:17. 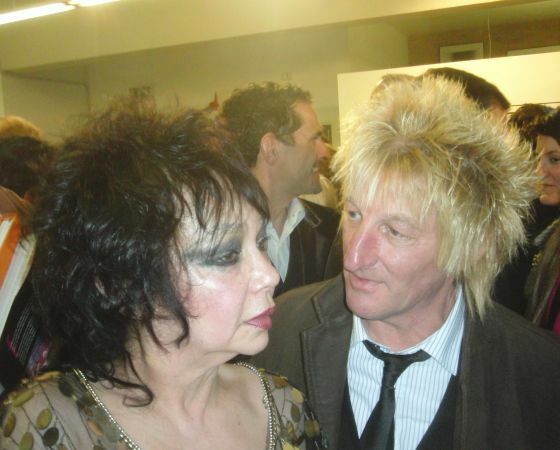 Duggie Fields & Iggy (2011). In the Seventies, Eigthies, Nineties and Naughties (sic) no interview with an (ex-) Pink Floyd member could be published without the obligatory Syd Barrett question. This enervated the interviewees sometimes at a point that they may have said things they would later regret but that are continuously repeated, decades later, by Sydiots all over the world in their quest to prove that member D, R or N still holds a grudge against that godlike creature named Syd. I's a bit like Paul McCartney who will, forever and ever, be reminded of his 'It's a drag' comment the day John Lennon died, a comment he gave to the press vultures while he was emotionally exhausted. Apart from the fact that Roger Waters needs an extra semi-trailer to transport his ego while he is on tour, he has a valid point although some Syd anoraks will obviously not agree with the above. Duggie Fields at Wetherby Mansions, ca. 1970. In December 1968 (give or take a month) Syd Barrett, Duggie Fields and a drop-out named Jules rented a three bedroom apartment at Wetherby Mansions. 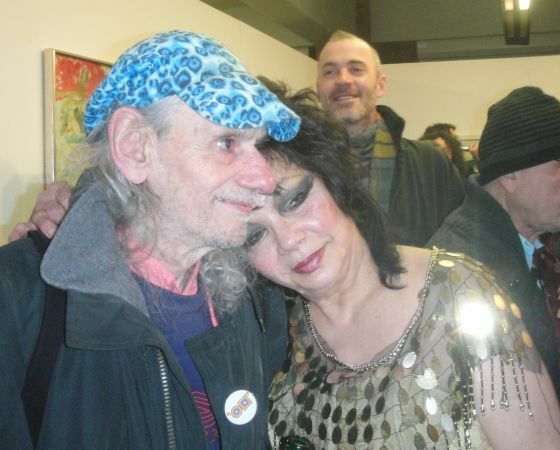 As Jules left a short while later the witnesses who can tell us something substantial about Syd's daily life are Duggie Fields, Gala Pinion (who took the spare bedroom about 6 months later), Iggy Rose plus the circle of close friends and, unfortunately enough, hanger-ons who were only there for the free food, free booze and free drugs. Syd Barrett was either a very generous host or simply too spaced-out to understand that he was being ripped-off. Our good friend Iggy Rose is rather reluctant to divulge too much to the outside world and anything that she has told the Reverend stays well inside the Church's sigillum confessionis. Gala seems to have disappeared in Germany of all places, so perhaps someone ought to create a Semi-Holy Church of Jules in order to find and question him. Most people who knew Syd seem to have valid enough reasons to keep a low profile, unless they want to sell overpriced Barrett photo books. 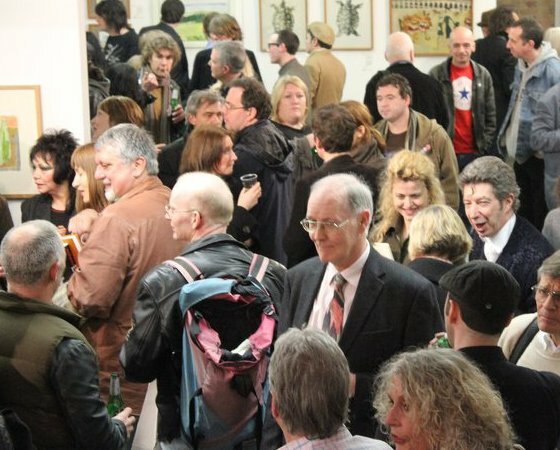 The result is that all weight falls upon the man who lived with Syd for a couple of years and who tried (and succeeded) in making a successful art career of his own: Duggie Fields. But it must have been, and probably still is, a pain in the arse that whenever he wants to inform the press about a new exposition they all friendly smile into his direction and say: “Fine, but we only want to know about Syd Barrett really”. So let's set the record straight, shall we? With a little help of our Spanish-sister-blog Solo En Las Nubes we hereafter present you an exclusive Duggie Fields self-interview (from the 24th November of 2010) and we will not add another word about Syd. Sort of. Artistically, a Duggie Fields interview speaks for itself and needs no introduction. Although there are some obvious influences on his paintings, his art – like with all great artists - is immediately recognisable. But the Duggie Fields label is not limited to canvas alone. His life is filled with very curious anecdotes. One of those is how he shared a flat with Syd Barrett (and – although only for a couple of weeks – with Iggy Rose [note from FA]), the protagonist of this blog. Exclusively for Todos En Las Nubes Mr. Fields has written this self-interview. An honor. 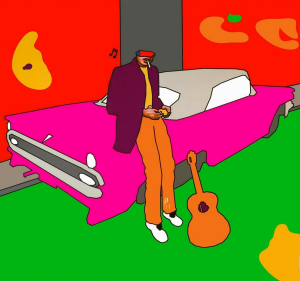 ARTSCAPE (juggler6) - Duggie Fields. So how do you start your day...? I check my emails. Facebook. And then sometimes I sit working on a new idea, a picture or less frequently a piece of music. And some times hours can pass without me registering. What are you working on then now? On the computer I have a couple of new image ideas started. How well they’ll develop I don’t yet know. And a new piece of music on the way, the first for quite some time. There’s also the canvas I’ve been working on for most of the summer now. That’s not so easy for me to say. If it has a narrative I’ve yet to work out what it is about. There seems to be some kind of story. There are two figures in the picture occupying the same, but not quite the same, space. Both looking at something but not quite the same something. Both figures have spiritual overtones. The male figure came from a statue in the graveyard just around the corner from here. The female figure was a chance vision at an Arts and Antiques Fair up the road in Olympia. Photographed randomly, not initially intended to pair with him but somehow ending there intuitively. Male Female - Duggie Fields. What’s “just around the corner” ? Just around the corner is Brompton Cemetery. Just around the corner is also the name of a series of photographs I have been taking. Almost daily and with my mobile phone and then posted on my Facebook page. The Cemetery is Victorian, designed to echo on a much smaller scale St.Peter’s in Rome, and ravishing when over-grown and wild as it was last year. I photograph in there regularly. Always managing to discover unseen statues, so many angels, and a wealth of ever-changing imagery. And also I take pictures just around the corner on the streets where I live. Earls Court, an area I’ve lived in now for over 40 years. In the same home, the one I first got with Syd Barrett shortly after he’d left the Pink Floyd and which we shared together for a couple of years or so before he left even further from the life he’d once lived, and that I’ve lived in ever since. Have you always taken photographs? At Art School I did photography briefly as part of my course there, enjoying time in the dark-room developing, processing and printing my own film, but not really getting on with their prevailing concepts of what the subjects should be. Over the years I’ve had various cameras, though nothing got me so involved again until going digital allowed me to print and process on screen. The camera phone I enjoy enormously, not having to carry a separate camera with me, one less item to fill the pockets and think about. I use it kind of as a visual diary. I upload the images to Facebook as it is currently simpler than adding them to my own website the way it is set-up at the moment. Note: This year (2011) Just Around The Corner evolved into a very agreeable book. That implies you might change it..? That will change at some stage, but it’s a job that just adds to the list of things to do. And right now that’s a growing list. The website (www.duggiefields.com) works well enough as it stands. But all its sections, and there are many already, could be expanded on. Like everything it is a question of time, and of priorities. Note: There is a Duggie Fields blog as well. What’s the biggest change then that might happen to it? Well apart from a dedicated Photography section, I have over 1,000 images to choose from to add there. Mostly landscapes and things, the “Just around the corner” series, “Tree offerings”, and “Curiosities”. There is more music to add. Quite a few more pieces in addition to what is already online. And lastly to update the “Word” section with some new writing. 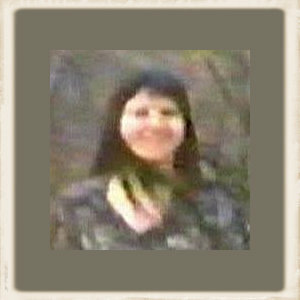 Have been working for the past few years on anecdotes from my life, from childhood on. Currently have written up to my early years in Wetherby Mansions. And when might this happen? © 2010 Antonio Jesús, Solo en las Nubes. Pictures courtesy of Duggie Fields & Jenny Spires. Notes & Introduction : the Holy Church of Iggy the Inuit. Translation mistakes, typos and all possible errors are entirely the responsibility of the Holy Church of Iggy the Inuit. Direct link: Duggie Fields, much more than a room-mate. Posted on 2011-10-07 at 16:39. 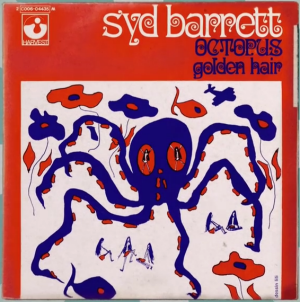 Last year in June a French 'Pathe Marconi' edition of Syd Barrett's Octopus single was sold for 10,500 Euro, a small fortune, if you ask us, unless you happen to be an administrator of a Facebook Syd Barrett group. 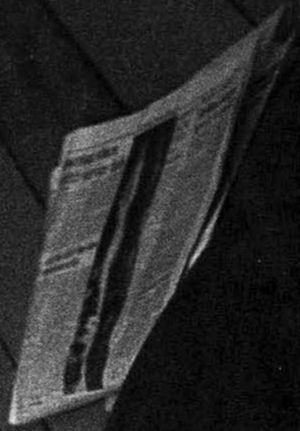 The single came from the ORTF archives, Office de Radiodiffusion-Télévision Française, and as such it was 'tattooed', labelled and written on. So why were collectors so eager to have this (less than mint) vinyl record in their collection? The French-German television station Arte tried to find an answer and made a 25 minutes documentary about it all, existing in two languages. When you read this the chance is big you can’t watch the show any more as it was only online for a week, in January 2017. On top of that there was a geo-block, except for Belgium. Probably France and Germany are still still thinking we are one of their underdeveloped colonies. The reason why this vinyl is so expensive is due to the fact that this particular edition has only survived in about ten copies (and one of those was recently lost in a fire). As such it is a Ferrari for vinyl collectors, as someone states in the documentary. They were only given away as promotional material and the superfluous copies were melted to recuperate the vinyl. Isn't recycling a good thing? The ORTF library got four, numbers two and three went missing over the years, euphemistically described by the program makers as damaged, and the first one was auctioned to the public. Those who are old enough to have seen The Wall movie in the cinemas may remember the intrepid interview that two Actuel reporters had with Syd Barrett in Cambridge. (Read it here: French Magazine Article - ACTUEL) Although the conversation with the madcap took only about six lines, and was mainly about a bag of laundry, it created quite a buzz. French like that. That same Actuel magazine also had an article about an adventurer archaeologist who knew where the mythical El Dorado could be found. Needless to say he couldn't but Actuel wrote a ten pages long article about it, just in case. Duggie, Peter, Bill & Jean-Michel. Arte does pretty much the same when they repeat the rumour that the Pathe Marconi sleeve could have been drawn by monsieur Barrett himself. They immediately embark to London to interview Duggie Fields. Fields doesn't immediately recognise Syd's style, but he isn't 100% sure either as there are certain Syd-esque style elements in the drawing. But several other details imply that the sleeve hasn't been made by Syd. First of all: it depicts a sea animal, while the Octopus in the song is a fairground ride. Second: the sleeve has the name of the graphical artist printed at the right bottom side. Dessin: lilli, it reads, which means drawing by Lilli. Peter Jenner has been interviewed as well. He doesn’t really tell us anything new, but this documentary wasn’t made for Floydian anoraks. He talks about the fast rocket that Pink Floyd was, unfortunately a rocket that exploded in mid-flight. I see him as a shooting star, he lifts off in 1966, he writes his songs, has an enormous success, and then he disappears. A third interviewee is Bill Palmieri, an American record collector who is an esteemed member of several Floydian groups, and who also happens to have an original French Octopus in his collection, after searching for it for over thirty years. He thinks there are less than 5 copies of this 'holy grail' in the hands of collectors. He talks with much love about his records, about Pink Floyd, about Syd Barrett. It is intriguing but quite a bit weird as well. It's pretty cool to see that he consults the Charles Beterams' Pink Floyd On Forty-Five book were the single is listed on page 69. Plenty of weirdos in Floydian circles, guilty as charged. The “less than five” guess is far below what is realistic. I’ve sold two different copies over the years and know of at least four other copies in existence. a few dozen at least are left and around. To further elaborate on the madcap’s enigma a French scholar is asked as well. Jean-Michel Espitallier, author of the quirky essay Le Rock Et Autres Trucs and translator of Tim Willis' Madcap in the language of Molière. He praises the lyrics of Octopus, in his opinion a predecessor of the lyrics that made progressive bands like Yes and Genesis so popular. A dealer got in touch with me a few months ago, he was accepting bids for an ok -but-not-exceptional copy... current highest bid was €6500 (+/- £5740, FA). A gallery with screenshots of this documentary on our Tumblr blog: Octopus. Direct link: The Octopus Rides Again. Posted on 2018-01-19 at 18:17. This is Part Two of our 10-years anniversary post. To read the first part, head over here: 10 Mind-blowing facts you didn't know about the Holy Church of Iggy the Inuit. Holy Church Wordcloud. Artwork: Dolly Rocker. Concept: Felix Atagong. The Holy Church of Iggy the Inuit celebrates its 10th birthday! Ten years ago the Holy Church of Iggy the Inuit started with a (big) bang, not coincidentally surfing on the waves that were created by the Cambridge City Wakes festival, later continuing on its own momentum. On the 8th day of the 8th month of the 8th year a first article was posted. OK, the old habitants of this forum must have seen it coming and the forthcoming Iggy the Eskimo movie triggered it a bit. The first post is just a try-out (to check parameters etc...). her picture on The Madcap Laughs sleeve (Stormy Pictures). For those who love statistics. Holy Church blogposts of the first decade. After a hint from Mark Blake, author of the Pink Floyd biography Pigs Might Fly, that Iggy used to go dancing around Purley and Caterham, the Church contacted (local) newspaper The Croydon Guardian, that had written a few articles about the dancehall The Orchid. Journalist Kirsty Walley took the bait, she interviewed Anthony Stern and Jeff Dexter and officially started Iggymania with her article: So, where did she go to, our lovely? (en passant making free publicity for The City Wakes and The Holy Church of Iggy the Inuit). So, So, So, where did she go to, our lovely? by Kirsty Whalley. Croydon Guardian, September 17, 2008. It gave the Holy Church a certain authority it didn't want in the first place, but it can't be denied that the search for Iggy was taken pretty seriously by some people (not in the least the Reverend who also started to believe in it). In that very first trimester we obviously reported about The City Wakes festival, especially when it was Iggy-related. 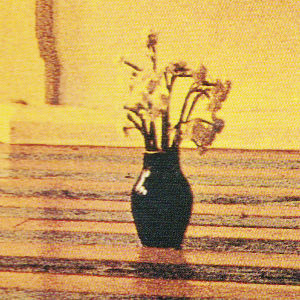 The Trashcan Sinatras commemorated Syd and Iggy in their song Oranges And Apples and several articles commented on The Other Room exhibition where Anthony Stern's Iggy triptychs were exposed for the very first time: Anthony Stern Photoshoot. As far as we know, The Other Room catalogue is still the only official printed publication where some of Anthony Stern's Iggy pictures have been published. Anthony Stern - Iggy triptych, taken from The Other Room catalogue. We were informed that Iggy could be found on another Floydian document, a Syd Barrett Home Movies compilation that had been shown once (and only once) before a 1990 Pink Floyd charity concert at Knebworth. 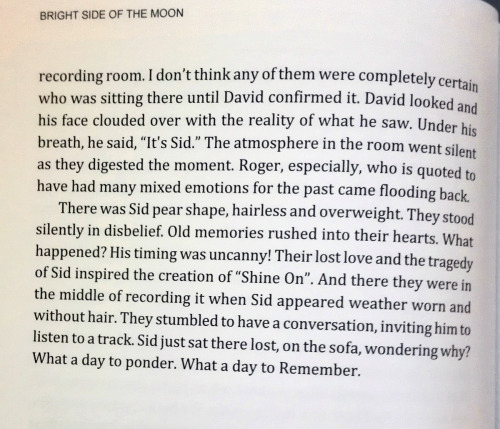 The Church (with - again - a lot of help from Late Night members) could identify most people in the so-called Lost In The Woods movie with the exception of 'a mysterious brunette' who was seen walking with Syd and Iggy (Love in the Woods (Pt. 1) & (Pt. 2)). A decade later she still has not been identified. Thanks to Julian Palacios, author of two Syd Barrett biographies and the administrator of a (now deleted) Syd Barrett highbrow 'research' forum, the Church was contacted, in January 2009, by the person who introduced Iggy to Syd Barrett four decades before. It gave the Church the reputation of being contrarious, but now, ten years later, this theory seems to be generally accepted. That you read it at the Church first, is thanks to JenS, our witness who wanted to remain anonymous, despite the fact that every level 2 Syd anorak knows who (s)he is. It would not be the only time the Church had to confront witnesses, who were high on the Floydian pecking order, with a 'false memory syndrome'. One of the weirder ones is Mick Rock's theory that Syd Barrett had a pink convertible parked before his door, while the few coloured photographs actually show it was 'midnight' blue. A pink car would also turn light-grey on the various Madcap Laughs BW pictures, but they invariably show a very dark-grey, almost black, coach. 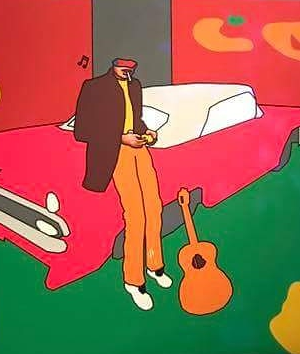 Also Duggie Fields, who must have passed the car parked in front of his apartment for months, remembers it as pink and has even painted the car in that colour, for the artwork that accompanied the Their Mortal Remains exhibition (2017). Of course the Pontiac Parisienne, with license plate VYP74, was later turned into pink for its role in the movie Entertaining Mr. Sloane. This movie, however, was shot after Syd Barrett seemingly gave it away to a bystander, although some witnesses still pretend the contrary after all these years. Others pretend it was a 'chameleon' car that originally was pink, then painted blue, then painted pink again. You can't win them all. Update 20181223: Iain Owen Moor (Emo), friend of the Floyd and the London underground remembers the car, when it was still owned by Mickey Finn. Thought it was black. I went in it a few times in 68 (?) with Sue Worth, Mickey's then girlfriend. The car seems to have had a life of its own like The Yellow Rolls-Royce. Syd Barrett and (pink) Pontiac Parisienne by Duggie Fields. His words unknowingly predicted the future, but that is a story we will keep for August next year, if at least the orange buffoon hasn't pushed the Armageddon button by then. Direct link: Bang A Gong (10 Years of Holy Church of Iggy the Inuit). Posted on 2018-08-12 at 15:22.